The Place Located at Orto Yishun, more famously known by its previous name Bottle Tree Park, Tasty Loong recently opened here replacing another Chinese restaurant in the same space. Some of you may find the name familiar as with the other restaurant by Chef Pung at Bedok, Tasty Court. And if Chef Pung does ring a bell, he’s one of the familiar chef faces seen frequently on Singapore television. Tasty Loong’s restaurant is right beside the large pond, giving you unblock views of the water with greenery and the North-South Line train tracks bordering it on the further end. As you can imagine, this restaurant enjoys a pretty serene view with a dining ambience which is rather unique amongst restaurants locally. The Food Expect zi-char styled food here, although we found some creations on Tasty Loong’s menu rather creative. First up, the flaming chicken we saw on various media outlets, the Crispy Dong Tok Roasted Chicken (S$24) grabbed the attention of fellow diners at the restaurant. 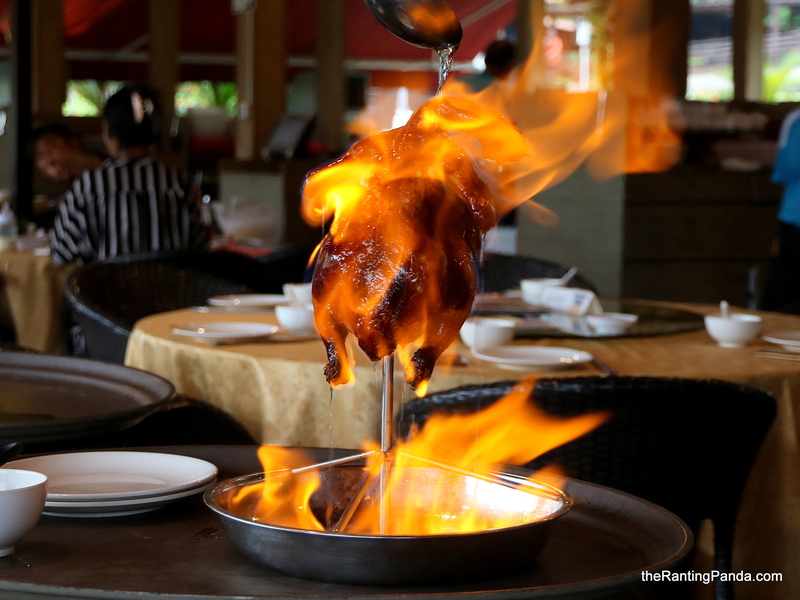 Served with the roasted chicken standing, the wait staff will proceed to pour rose rice wine over the chicken before setting the chicken into flames. This not just gives diners a visual experience, the chicken also gets the crispy skin texture. I would recommend this dish if you visit Tasty Loong, just be warned that it may not be that ideal for young ones due to the slight alcohol content. Another creative take on local favourites, the Fried Kway Teow with Singapore Chilli Seafood Sauce (S$14) takes inspiration from our typical Hor Fun, spruced up with Singapore’s Chilli Seafood Sauce. Frankly, I do not see how this will fail, and wondered what took us so long to have this combination done. Despite its low pricing, the portion is good for at least three to four persons to share, and you might just crave for more. To go along with the mains, try the Charcoaled Tofu with Minced Pork and Dried Shrimps (S$14). The tofu is well executed, with the minced pork and dried shrimps toppings giving a good mix of textures when savouring this. We ended our dinner with the Chilled Whole Coconut Pudding (S$7), although the pudding is rather bland. I did enjoy the Coconut ice cream though. Rants It is not an air-conditioned place, and not exactly easily accessible without a car. It is also not the best place to visit if the weather is not at its best. Will I Return Again? I didn’t manage to try many items on the menu. The dishes we had are reasonably good, though it is the surrounding greenery and lagoon which makes it a pleasant dining experience.